Millions of people struggle with anxiety and depression but don’t talk about. Sometimes we don’t talk about it because we don’t want to be judged. Sometimes we don’t talk about it because we are afraid that it isn’t “normal”. It can make you feel like no one will understand and that is incredibly lonely. In fact, there are thousands of coins just like this one that have been found or are waiting to be found by people who do know what it feels like; people who do understand how you feel. Help me break the silence. Help by leaving a comment. 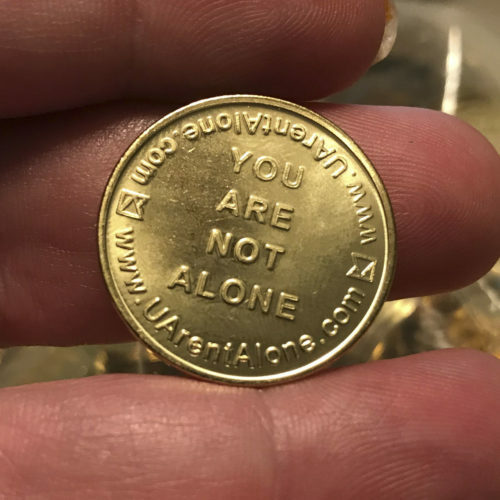 Help by telling all the other people who find a coin and come to this site how you feel. Let them know they aren’t alone. You don’t have to give your name or contact information. Just talk about your experiences so that other people can also see that they aren’t alone either. Sometimes just knowing that you aren’t alone might give you just enough hope to fight another day. This project is partially funded by an Arts Commission Accelerator Grant made possible through support from ProMedica, the Ohio Arts Council, Toledo Community Foundation and other generous supporters. i spend so much time pretending to be happy, but i worry that if i disappeared tomorrow, no one would notice or care. and while i know that’s not true – that’s the voice in my head ALL the time. but it’s just a voice, and we all have that voice. and you’re never alone. I found the coin at my university in Maryland. Sometimes I feel so small. It’s more noteworthy to find a day, or moment of a day where I am happy to be alive, or simply want to be alive. Otherwise it’s just drab apathetic machinework life. Things aren’t as dark now as they were in the past, but dark moments still come from time to time. I used to go to a therapist, and I got over my main negative cognitions, but now I tell myself I’m fine, even though I’m struggling with prolonged depression & anxiety and I likely need medications. It’s scary, because admitting my mental health issues even to myself makes me feel less than people with good mental health. I waste my time and screw up my sleep schedule as some bizarre form of self harm in which I want to induce disassociation so I can not have to deal with the monotony of life. But at the same time disassociation is distressing and I want to want to live, and have a life. But I don’t want that enough to make the changes necessary to improve my condition. I run a group and hear others who struggle with similar issues. Yet I still feel alone sometimes. You may find it hard to believe you aren’t alone. But you aren’t. This is a good thing. Thanks, Malissa, for doing it. I may be alone physically, bit spiritually… God is always by my side!! I found a coin in Toledo Ohio at the star diner on Alexis road.. I found a coin outside a bus stop in Grand Forks, North Dakota. Thanks. I keep it with me everywhere I go now.